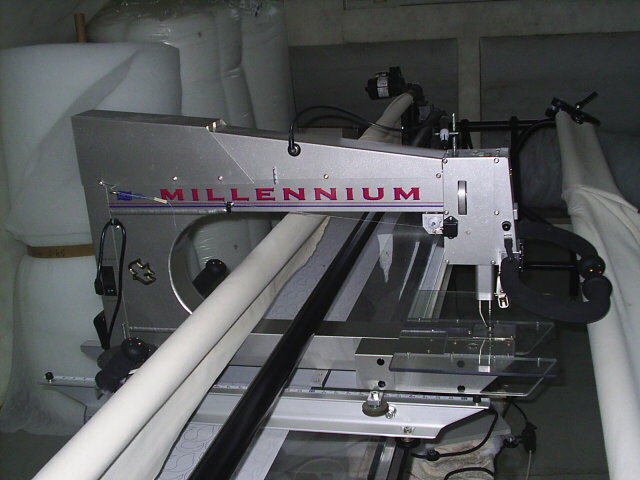 qui est interessé par une machine "millenium" d'occasion complete ! Sorry Phil I do not speak French. It looks like you have a pretty new machine, so should I say Wow, congratulations on a new toy, or are you just showing us your set up, or are you wanting to sell??? I'm so frustrated with myself that I can't intelligently speak with you. I think you are saying you are looking for someone interested in buying one complete Millenium... that it's time to go to a new home??? Good Luck. unless you decide to move to a new home over here ! where are you located exactly , nearby the sea ? J'habite en Espagne. Le Prix de votre millenium per favor? Thanks Phil. I'm not looking to buy a different machine, Just trying to find out if that is what you were saying. We are almost dead center of the state, in Sanford. Wish I were by the coast. Good luck in selling the Millennium. Contact APQS and list it with them, also. ça y est j'ai vendu ma machine. celle ci est elle toujours sur le marché?